Our series "What New York Wine Needs Now" was conceived with the intent of getting thoughts and insights on the past, present and future of New York wine from those in and around the New York wine industry. 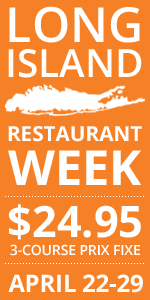 So far, we've heard from two winery owners and a retailer but this week, we turn our ears to hyper-competitive restaurant industry. And we went right to the top of New York City dining. Juliette Pope is the beverage director at one of New York's top restaurants, Gramercy Tavern and has been since 2004. As such, her customers are among the most sophisticated diners in the world. Can local wines succeed in a program like Juliette's? Where does New York wine need to go to be even more successful? Read on to find out. What is your overall impression of New York wines? Are world-class wines being made here? New York wine seems to have made great strides in the last 5-10 years that I have been actively involved in tasting and buying them. “World-class” is a strong term, but there are some excellent wines — and no doubt hundreds that I have not even had the chance to taste yet — out there. In what ways has New York wine succeeded over the past 3-5 years? Slowly but surely, New York diners have awakened to the possibility of trying wines from our own “backyard.” I am not sure that that is due to efforts on the part of the New York wine industry as much as the rise of interest here and around the country in eating and drinking local products. Whichever the case, we are seeing a difference and I am very pleased for these wines to get the attention that some of them deserve. What is the most significant factor holding New York wines back right now? If the main competition is domestic wines, then the toughest competitor is obviously California, which has a much longer history of winegrowing and has a lock on the American wine press. 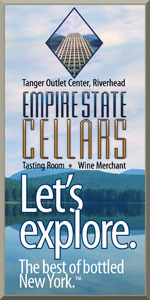 There are a number of local wines that can compete quality-wise with California wines easily, but what you can’t get from the microclimates of the Finger Lakes or Long Island or the Hudson Valley is blockbuster wines with high ripeness and alcohol, which is what is prized by so many mainstream wine drinkers and press. For sure, but that said, I am getting more and more phone calls from small wineries or from reps for groups of wineries, so that is a promising sign. They are in a tough position, trying to grab some attention and shelf space in the city, where literally everything in the world is available to us. And New York wines get lost very easily in large distributors’’ portfolios, but then again, it is those distributors who have the reach, the service know-how and the pockets to pay for the wines. Trying to establish a business niche must be extremely challenging for small New York wineries. Do you carry New York state wines on your list? If so, how many and what ones? If not, why not? Until last week, we had three on by the glass (now just two). By the bottle, we have approximately 15-20 at any given time. Current wineries represented include Shinn Estate Vineyards, Channing Daughters Winery, Paumanok Vineyards, McCall Wines, Castello di Borghese, Wolffer Estate Vineyards, Dr. Konstantin Frank, Hermann J. Wiemer Vineyards, Standing Stone Vineyards, Red Tail Ridge and Whitecliff Vineyards. What has your customers' reaction been? Are they buying? Wines by the glass do incredibly well since they give an opportunity to taste without a major commitment; bottle offerings naturally move more slowly but well enough, certainly more steadily than they used to. The reactions are ones of surprise and pleasure and curiosity. I tend to gravitate naturally toward the Vitis Vinifera wines coming from New York, so am not sure if that means that the non-vinifera/hybrid presence is a hindrance or not. But my guess and assumption is that the greatest potential for quality New York wines does not lie with those grapes. Aromatic, acid-driven whites from the Finger Lakes -- like riesling -- and aromatic, lighter-style reds -- cabernet franc and merlot -- from Long Island. Those are not my preference per se, but what seems to make sense for those regions, what they do their best work with, when in the hands of the most meticulous growers and winemakers. Continuing the focus on growing techniques that reduce yields and improve ripeness and winemaking techniques that showcase the virtues of these wines -- light body, aromatics, acidity, finesse -- rather than trying to twist them into something that they are not meant to be: full, powerful, and tannic with heavy oaking for example. The measured, thoughtful, and insightful answers to the questions above show why Ms. Pope is one of the finest and most respected sommeliers we have here in NY. Her words are high praise indeed for the industry. Yes, Ms. Pope is a consummate wine professional and an excellent wine promoter. World class certainly is a strong term, but why does it get thrown around with respect to emerging regions in other countries and withheld when it comes to newly discovered regions within the USA? New York's commercial wine grape growing history is as old--if not older--than California's; it depends on what you call wine grapes: are they the ones you like or the ones that are grown to produce wine? Reducing yield may have a place in the search, but it is not an absolute answer to viticultural questions of quality or ripeness. Perhaps to improved the overall New York wine business, Cornell's College of Agriculture and Life Sciences could refocus its viticulture and enology program to clone Ms. Pope, so replicants could be placed in the top 100 Manhattan restaurants. Seriously, Ms. Pope expresses exactly what so many desire from the wine directors of New York City’s top restaurants, a willingness to understand the wines of New York, a willingness to serve appropriate NY wines to their customers and most importantly that they provide constructive criticism to the New York winemakers and winery proprietors. Lenn, thank you for this series of interviews and this one with Ms. Pope in particular. We have had the privilege of knowing and working with Juliette since she first took over as wine director at Gramercy Tavern back in 2004. Her thoughtful insight, probing questions and exacting palate have always guided and inspired us to seek more out of the wines we grow. There are very few like her in this industry.